I love the spirit of New York City. Flashy, extravagant, loud, glitzy, cosmopolitan: all that jazz! It fits my Razzle Dazzle look like a glove! 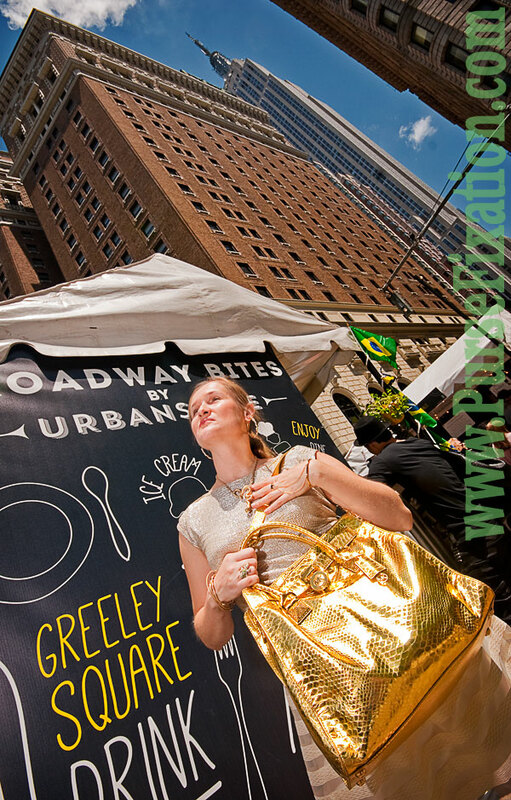 Gold, metallic accents, shimmer and glamour, it’s what I see in the flamboyant eyes of NYC. There is so much to do; something for everybody. I recently saw “Chicago” on Broadway and it was grand! If you liked the movie with Richard Gere, Renée Zellweger and Catherine Zeta-Jones, you will be awed. And I was in the front row! The act I am giving you with this post definitely has a lot of flash. I picked the sparkling golden top (Worthington, JCPenny, similar, similar), shimmering Ann Taylor skirt and gold Jessica Simpson heels. This shiny blouse is all about texture and glistering metallic material. The fabric resembles so much the glossy python-embossed leather of the Michael Kors Hamilton handbag (similar). I also love the black zipper at the back that adds the edgy character to this top. The Ann Taylor Striped Organza Skirt is a sparkling jewel itself. I adore the combination of stripes and organza fabric that gives the skirt that luxurious, silky-like look, lightweight effects and beautiful volume. For some of you who may not be familiar with the organza, it is thin, stiff and sheer fabric made from silk or woven with synthetic yarn. Often seen on the Red Carpet, it’s used for gowns and wedding dresses. Silk organza is mostly woven in the mills in China and India. However, the deluxe versions come from France and Italy. I must say I love this fabric. It gleams with a gold metallic intensity that pairs so well with all the other shiny pieces of this outfit. The inverted pleats, together with the perfect length, enhance the feminine look of the skirt. And, it feels so light that it makes you want to twist and turn all night in it! I put these Jessica Simpson strappy heels on and I am ready to swing! Seriously, they are comfortable! I love the snake-like texture and gold color that complement perfectly my Michael Kors bag (similar). New York City has so much to offer, day or night. It’s hard to choose your favorite streets or corners. I love wandering around the city and exploring, but I also catch myself on coming back to the same familiar areas: Broadway, Avenue of the Americas, Fifth and Madison Avenues. People, colors, lights, energy, sounds seduce and inspire me all the time! It’s amazing to stand in the middle of it all and feel a part of what makes New York City such a captivating place! My Razzle Dazzle look wouldn’t be complete without some swell jewelry pieces. When I saw this snake set from Eva Mendes collection (similar necklace) at NY&Company, I thought this was something really remarkable. The necklace itself is a great conversation-starter. Striking zigzag snake, curved with details, covered with sparkling stones and those green eyes immediately attract your attention. The earrings and three bracelets feature the same snake and point to the python-embossed leather of the purse. To keep the reptile theme, I picked a crocodile ring (Bonton, similar, similar) with shiny white and green stones. The other golden ring and bracelet combo (Aldo, similar) adds a modern twist to the jeweled look. I love these two-in-one pieces! Sophisticated and eye-catching. I like how the two loose chains connect the bracelet with the ring and sway on the top of my hand. And, here I am! Ready to conquer the glamorous heart of New York City! The city that never sleeps but that makes you believe in dreams! Did I Razzle Dazzle you? What is your inspiration for your glamorous looks? Happy 4th of July weekend!!! Gosh that skirt sounds divine and I would LOVE to see Chicago on Broadway that must have been amaze balls! And I have to stop in that food market in Greeley Square because it is always to crowded but I really want to give it a try. Hope you had a great 4th! woooowww! u look stunning lovely!!! Love all your prose and poses on this post. Also your verse quotes–all are WAY appropriate for your Razzle Dazzle theme. I think MOST of all I love the backdrops you’ve used and the way your photographer (Dave) has used angles and perspective to make every shot fascinating. I’m still doubting that I could walk in such shoes! Onward to the Stars, Renata! Nice pictures, you look beautiful! Beautiful MK bag! Nice pics!